How do I interact with Coaching? Ambition Coaching is composed of Programs and Action Plans. If and when your Organization involves you in Coaching, we want you to feel comfortable accessing and navigating Ambition Coaching. 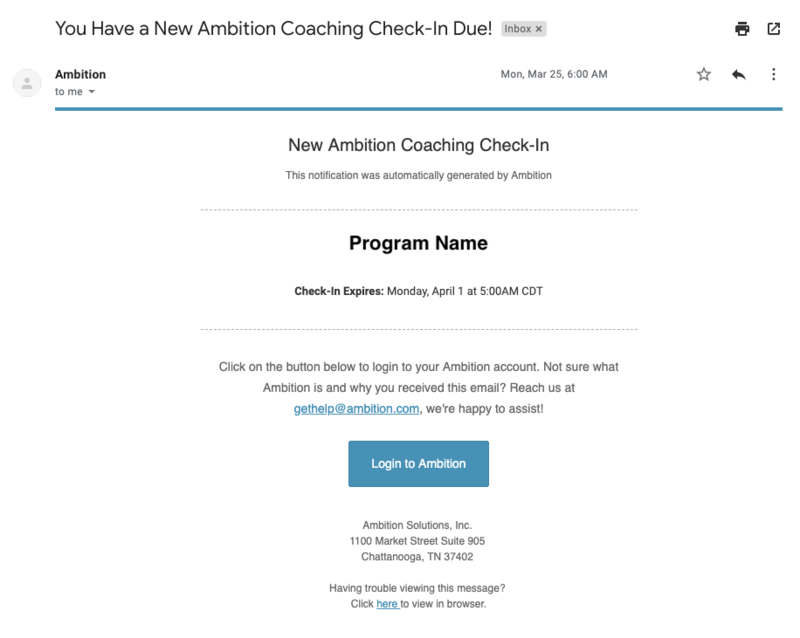 How will I know I am in an Ambition Coaching Program? How do I access and complete Coaching Check Ins? Are previous Check Ins still searchable/accessible? How will I know I am involved in an Ambition Action Plan? How do I access and complete an Action Plan? If and when your Admin and Managers involve you in a Coaching Program, you will be notified both in app and via email. 1. Open the left navigation and click Coaching > Check Ins. 2. Click the green Start button on the respective Check In you need to complete. Clicking Email, will allow you to directly contact the Program's owner. Helpful if you need to remind them that you are OOO or to provide context if the Check In cannot be completed. You can also view your Ambition metrics. Any Goals and any Action Plans associated to this check in are also visible. 4. Click the green Check Mark when finished. 5. The Program's Owner will be notified both in Ambition and via email that your Check In is ready for review and approval. Your Manager can opt to request feedback or approve. You will receive notification of either action. 2. Click the blue Filters button. 3. Search for the respective Check in by Status, Rating, or Program Name. Open: Check In requires action from you. Search for Check In by respective Program's Name. On Creation: you will be notified upon creation of Action Plan. On Completion: Both you and your Manager will be notified upon completion of Action Plan. On Expiration: You and your Manager will be notified after the Due Date if the Action Plan was not completed. 1. 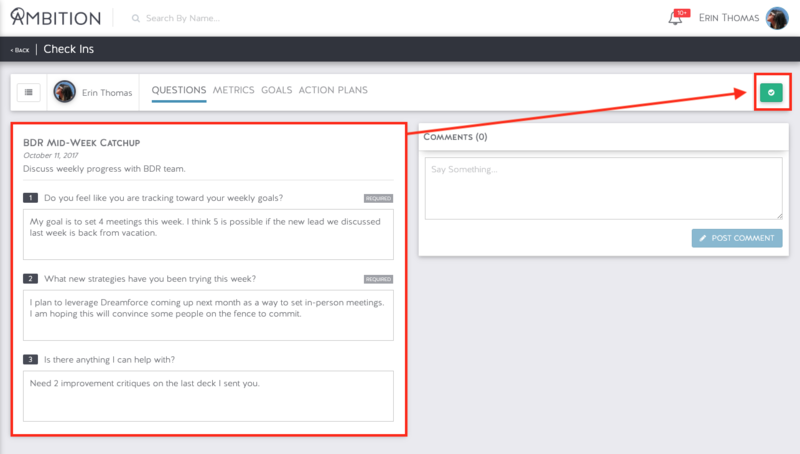 Open the left navigation and click Coaching > Action Plans. 2. Click View on the respective Action Plan you need to complete. 3. Complete and/or address the respective items included in your Action Plan. Optionally leave comments to provide more context. 4. Click the green Update Action Plan button to submit your Action Plan.